An undivided rectangular structure With additional modern N. vestry and W. porch. The walls of local rubble have been largely rebuilt, 1 and all openings together with the W. bell-cote are modern but the noteworthy 15th- century roof has been retained, though much repaired. The W. part of this unsually long church may be associated with that first recorded in the late 13th century. The S. Wall, which alone has original footings, shows a change of build where the nave and chancel meet, at 46 ft. from the W. end, suggesting an extension eastwards almost certainly to be associated with the 15th-century roof. Though the junction lacks quoin-stones as massive as those at the W. angles, those now at the E. angles could have been transferred with the erection of the newer work; alternatively the 13th-century church may have had a narrower chancel, which would make massive quoins unnecessary at this point. The blocked S. doorway is probably not original, but at the W. end of the N. wall a wider doorway, also blocked, goes with the rebuilding of that wall. The roof(Plate 24) is on ten trusses which arc closely set and supported by modern wall-posts and stone corbels. 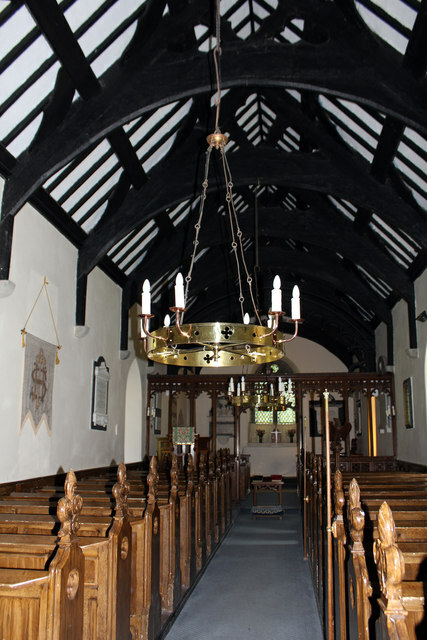 All are of arch-braced collar-beam type, and have cusped raking struts except for the first two from the E. Apparently this first bay was meant to be ceiled as a canopy of honour, since the second truss is enriched only on the W. side of the soffit (apart from modern fretted cusping), and from here westwards most of the lower purlins are moulded, and the upper stop- chamfered; there are larged cusped wind-braces in all bays except the first. This roof, though much repaired, is a good example of its style, to be dated probably to the 15th century. Fittings.-Books: registers, see p. cxxxv. Font (Plate 26): of sandstone, octagonal bowl and stem, the bowl chamfered below but otherwise plain, on a moulded circular base above a square block chamfered above; the bowl inscribed with date 1638. Hatchmen,fs: in chancel, at S. side, two, both of the family of Edwards, of Nanhoron (No. 1615); early 19th- century. Inscribed Stone: see No. 1633 below. Memorials: in chancel, (i) on N. wall, white marble tablet on black matrix, to Richard Edwards of Nanhoron, 1704; also his eldest son Thomas Edwards, 1738, and second son Timothy Edwards, 1749; also Richard Edwards, 1770, eldest son of the latter; it has an Ionic pediment above a cresting of acanthus, and a base decorated with floral sprays below a guilIoche. Sculptor: w. T. Hale. Mid-19th century. (ii) On E. wall, white marble tablet on black marble matrix (Plate 37), to Capt. Timothy Edwards, R.N., of Nanhoran, 1780; above, an Ionic cornice bearing naval panoply flanking a Grecian urn; below, a half-round bearing a shield-of-arms in relief, quarterly, 1 and 4 paly arg. and az. (wrongly hatched for gu.) (Edwards of Nanhoron), 2 mId 3, gu. a chevron or a chief er11l. (Sir Gruffydd Llwyd), in escutcheon, harry wavy of 6 arg. and az. (Browning), crest, all rm proper embowed to dexter holding a fieur-de-lis. 3 Sculptor, C. Harris, London.” (iii) In churchyard to S., table tomb to John Williams of Tyn-y-coed, doctor and minister, 1673 (in Latin), with shield-of-arms above, a chevron betlVeen 3 nag’s heads erased (for Meirion Goch).5 Plate: (i) Silver chalice (Plate 40), with deep plain beaker-shaped bowl on a short stem encircled by three lines, and moulded base. The bowl carries three stamps, each in a shield: the letters PP (for Peter Pemberton), STERLING (a Chester stamp), and C (? ), the date-letter for ca. 1692. 6 Height 5 t! ins. (ii) Silver paten-cover with flat edge and short foot, belonging to (i). Diameter 4* ins. Visited by Sir Stephen Glynne in 1852, Arch. Camb., 1900, p.315. 2 Possibly ‘Lanekiant’ ca. 1254, Va/uatiolt of Norwich, pp. 190-1; clearly ‘Llangyan’ in 1291, Taxatio, p. 294; in 1437 united with Llanbedrog, together with chapel of Ewarthere (se. Gwerthyr), Ca/. Pat. Rolls, Henry VI, 1436-1441, p. 18; in 1515 and 1535 again by itself, L. and P., Foreign and Domestic, Henry VIII, II, No. 1307, and Valor Ecclesiasticus, VI, pp. 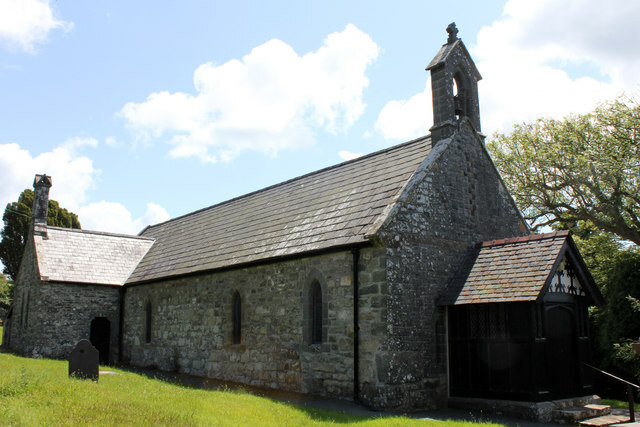 xiv, xviii; but later a chapel of Llanbedrog, Pryce, passim. 3 See Griffith, Ped., p. 16I. R. Gunnis, Dictionary of British Sculptors, 1660-1851 (London, 1953), S./l. Charles Harris, p. 188. S Griffith, Ped., p. 194; Diet. Welsh Biog., s.n. p. 1047. For inscription see G/eaniltgs, p. 123, amending first word as ‘Occubit’. © Copyright Jo Turner and licensed for reuse under this Creative Commons Licence.